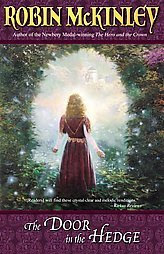 Once upon a time I had a friend who (strongly) recommended that I read the book Beauty: A Retelling of the Story of Beauty and the Beast by Robin McKinley. Given the fact that the Disney classic by the same time is my FAVORITE Disney movie of all times, I agreed, though doubtful. Nevertheless, friendship drove me to it and for the love of friendship, I immediately turned around and foisted the book on everyone I knew. I even offered it to some people I didn't know, all in the effort of making sure the book got the attention that I felt it deserved. As I read along and internally processed the above four stories, I was guessing as to which would be my favorite story and why. First I was going to tell you that, as was typical, the best story introduced the book so that the reader would be hooked, hoping to find the next three half as good. The first story about the Stolen Princesses was quite clever in the way she wove the character's lives together, although they spent the entire story apart (or in constant threat of being apart). Of course, anyone talking about Fairy Land these days is going to automatically fill me with warm and happy memories of Disneyland so I was pretty much sold on this story before it really began. Next I was going to tell you that The Princess and the Frog is one of my favorite fairy tales of all times simply because I think it's amazing that any girl would ever consent to kiss a frog. Ever. (I quit touching frogs when I was four years old when I picked one up only to have it relieve itself on my hands. I didn't appreciate being dirty as a child. Of course, I wouldn't appreciate that very much as an adult either -- furthering my wonderment of this particular fairy tale.) McKinley puts her own twist on this tale with an evil prince and the frog eventually being thrown against a wall instead of being kissed, (that makes more sense anyway), but it's still good. The Hunting of the Hind was probably my least favorite of the stories in the book. However, I appreciated the characters so much more than in the other tales that this story still ranks in my book. I think The Hunting of the Hind could have been more interesting if it were longer. This is one where I think McKinley would have done better to expand it and fill in the characters a little bit more than she did. However, who am I to complain? It's still a charming fairy tale, regardless. Lastly we have The Twelve Dancing Princess which is another of my favorites. Only I'd forgotten all about it so it was kinda fun to revisit it! Personally, I thought this story, more so than all the others, holds the most true to its original telling/source. From what I remember, it really does follow along closely. The question of the hour is: DOES McKinley tell a bad story? I'm starting to doubt it. She's an excellent story-teller. Period. She has a style and charm about the way she relates old stories. Much like Disney liked to "plus" up his ideas, going above and beyond what was expected of him in terms of animiation of public expectancy, McKinley does the same thing with her stories. She adds personality and detail to characters making them easier for the reading audience to identify with. She draws her readers in with humor and beautiful phrases that make you dream of castles and fairies while still keeping you firmly grounded. It's hard for me to put into words how intriguing she is and the only thing I can think to say is that she's just a really good storyteller. That's pretty much all there is to it. The words flow, as does the laughter and the hope. I enjoy her and, if you haven't yet had the pleasure of an introduction, let me do the honors. These books sound really good. I have put a request at my library for them. I look forward to reading them. Thanks for telling us about them. I'm glad that she writes these books, because I'm afraid the art of storytelling is nearly lost. I really need to check her out. Her books sound really good, and I've seen Beauty around for a long, long while but have just never picked it up. Oh, to only have more time. . . I love Robin McKinley books. They are fabulous. I have not read The Door in the Hedge but now I must (I think this may be the only one I have not read yet).